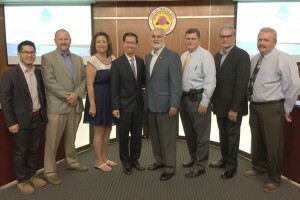 Assemblymember Ed Chau (D-Monterey Park) held a Water Informational Forum for residents of the 49th Assembly District at the Temple City Council Chambers on Saturday, August 29. The Forum was conducted by water policy leaders from the San Gabriel Valley who presented on topics, such as “The Status of the Drought in California,” “Conservation Methods,” and “The Future of Water in California.” The goal of this community event was to provide residents with the information and resources necessary to conserve water during this period of drought in California. California is in the midst of one of the most severe droughts on record. According to the California Department of Water Resources, the statewide water content of Sierra snowpack is at five percent of average for April 1st. These levels are lower than any year in records going back to 1950. Snowpack provides about one-third of the water used by California’s cities and farms when it melts into streams and reservoirs. The presenters at the forum included Thomas Wong, Board Member, San Gabriel Valley Municipal Water District; Ken Manning, Executive Director, San Gabriel Basin Water Quality Authority; Dan Arrighi, Water Resources Manager, San Gabriel Valley Water Company; Shane Chapman, General Manager, Upper San Gabriel Valley Municipal Water District; and Tony Zampiello, Executive Officer, Main San Gabriel Basin Watermaster.